Director: Chloé Zhao. Cast: Brady Jandreau, Tim Jandreau, Lilly Jandreau, Lane Scott, Cat Clifford, Terri Dawn Pourier, Tanner Langdeau, James Calhoon, Derrick Janis. 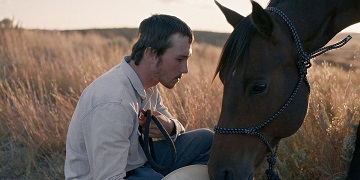 Screenplay: Chloé Zhao. Twitter Capsule: Tender to a point but its story tropes and magic-hour aesthetic strategies are belabored to the point of mawkish cliché. VOR: ④ It can get patronizing to praise a film for focusing attention in unusual places, but I appreciated Zhao's risk-taking production choices.